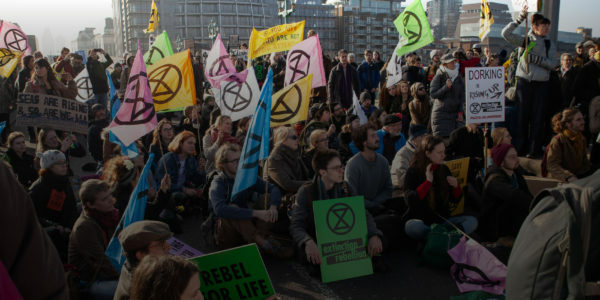 The Art Group helps Extinction Rebellion look fantastically rebellious. All the visuals you’ve seen have been through our many hands. We’re an open group – anyone can join – or you can form your own art group. We have assets and advice to help get you started, please contact us for more information. If you’re looking for ready-made artwork there’s a list of downloads below. These range from ready to print flyers and leaflets to large scale banners. There are also print at home posters, screen print patches and make your own banners. All the artwork is free to use but do not use any of the artwork commercially, however well-meaning (even fundraising). Note the artwork in the document below is quarter size. Note the artwork in the documents below is quarter size. All downloads are zip files. Each contains a numbered visual showing the full banner with page numbers that correspond to an A4 template. You can use the A4 template as a paint guide. We encourage using waste / off-cut fabric wherever possible. We advise using old wallpaper for stencils. Just lay the printed sheets, in order where appropriate, over the wallpaper and cut through.